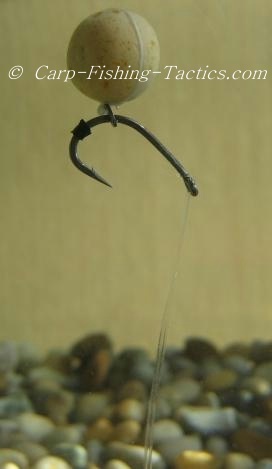 This is another rig created by Adam Penning, and featured in the Fox guide to rigs DVD. This fishing rig is exclusively a pop-up rig. 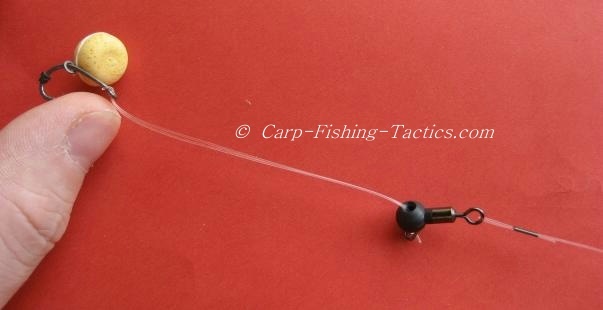 It is another version of the 360 degree rig but, it gives total movement of the hook because the boom is not attached to the shank of the hook. This means you can control the length of the pop up hooklink, thus allowing to present a pop up bait much higher than the 360 rig can go. 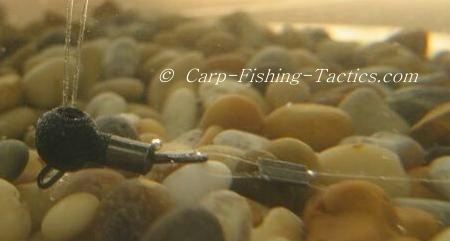 The pop-up carp rig shown above is not exactly the same as the TB rig shown by Adam in the fox DVD. Adam has the double vertical stiff link much shorter, only about an inch high. I have adapted it so I can pop up my bait to 3 inches for when fishing in between weed beds. The best thing about doing it this way is I can shorten the vertical link very easily, I can also change it for another material or colour. The use of a horizontal stiff link boom from the lead means that the hook is in direct contact with the lead when a carp takes the bait, this gives it more effective hooking potential. The horizontal hooklink stiff boom can also be changed to make it shorter, or change the material to suit the bottom of the lake. In the original rig, Adam Penning used a flexi ring swivel to attach the hooklink and boom line. I have changed it slightly and made use of a helicopter bead with a rig ring underneath. This is so I can add extra putty weight to the bottom and control pop up buoyancy without it affecting the swivel movements (see other photos below). 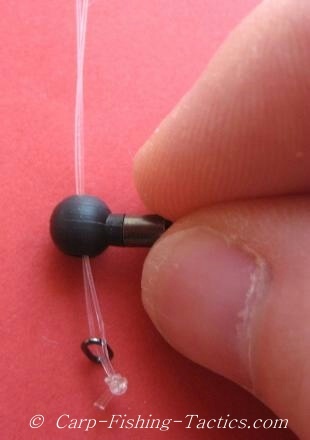 There was no knot tied to secure the hook, instead I doubled the stiff line then threaded it through the eye. It was then pulled further until the loop could slide over the point of the hook and pulled back down to the eye. The rig ring and float stop was threaded on after securing the line. 2. 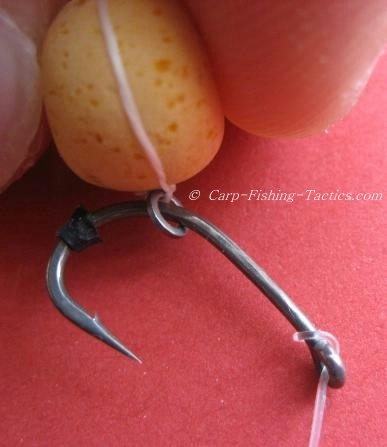 It helps hold heavy putty in place if there's a need to counterbalance a bigger pop up bait. Adam used a tungsten bead to balance, but I feel that putty gives the ability to fine-tune the balancing of a pop up bait. As you can see the helicopter bead gives the popup rig plenty of vertical movement. This allows the hook to move freely inside the mouth of a carp, and this gives greater ability for the hook to catch a hold. I test the strength of the pop up fishing rig before using it. 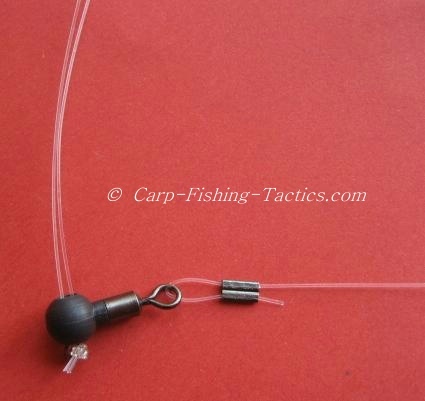 I also test how the fishing rig looks in water before casting it out. How the rig is presented in water. The vertical stiff, double hook link can rotate inside the helicopter bead, so if a carp approaches from any side the rig will work well. You can see how the bead sits on the bottom. More weight can easily be added to the rig ring without affecting the swivel's rotary movements. How the pop up looks underwater. 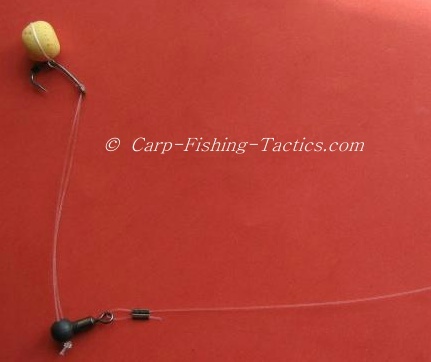 The hook will still turn around if a carp comes to take the bait from the right side in the picture. If you want to see how Adam Penning creates his version of this best pop up rig then you can purchase the Fox essential guide to carp rigs at all good tackle shops.